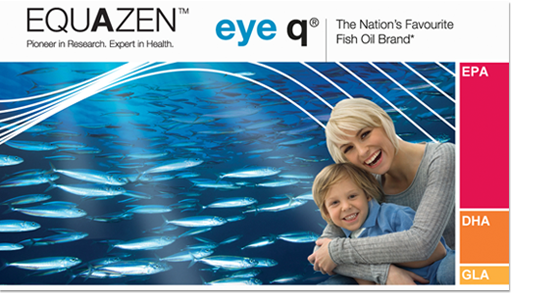 Equazen Eye Q uses a unique marine fish oil that has four times more EPA than DHA. This allows the EPA to function better, and give it a more active role in helping to maintain the eye and brain in healthy functioning order. We advise taking two capsules per day with food. If you are starting supplementation after a long break or for the first time, we suggest a daily intake of six capsules per day for the first twelve weeks, in order to build up the body’s levels of essential fatty acids. This means it’s best to start with the 180s or 360s, which will provide respectively enough capsules to last around one or two months. Once you’re on the maintenance intake, just one pot of 60s will provide around one month’s supply. Hi-EPA fish oil, Evening Primrose Oil, Natural Vitamin E (as d-alpha tocopherol, from IP soya). Capsule shell: Gelatin, glycerol, purified water. 1 EU recommended daily allowance. +∞TE = d-alpha tocopherol. Equazen recommends taking six capsules a day for the first 12 weeks to ensure an optimum intake of long chain fatty acids, and then reducing this to a maintenance dosage of just two capsules a day thereafter. The dosages are suitable for both adults and children over 5 but those aged under 5 may want to start on 2 capsules a day and gradually build up to 6. Capsule shell: Gelatin, glycerol, purified water.